"We have offered the course once locally, made improvements based on the feedback, then asked Naresh Giangrande in Totnes for input. He made several good suggestions which we have also incorporated. (Naresh had very kind words to say about the program - both the idea of doing it and the execution.)" Structured as six sessions of two hours each, the course is a great way to introduce your members to the concepts of Transition. Visit their website to download the latest version of the course guide. 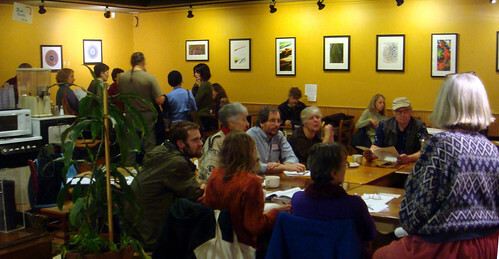 On January 11th, 2010 Sustainable NE Seattle held their first orientation meeting with twenty-six people registered, and split into two groups. "This photo shows the two groups after they divided up by geographic proximity. Together we pretty much took over the coffee shop. (We had permission ahead of time)," wrote Leo Brodie. Thanks to Sustainable NE Seattle for sharing!